Saturday, March 18–Paper Wings (website here) is a new, old-fashioned acoustic duo featuring Emily Mann and Wilhelmina Frankzerda. These two young artists have been deeply immersed in the West Coast music scene for most of their lives. Now they join forces to create music based on their shared love of tradition, old beauty, and the compelling need for new and original sounds. 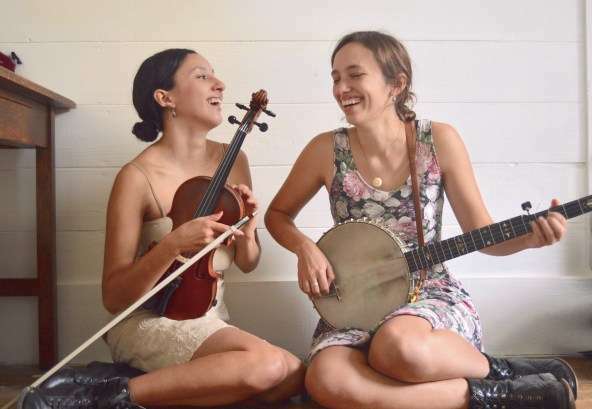 Their duo features classic vocal harmonies over a rotating cast of fiddles, guitar, and banjo. Between the two of them they have had the pleasure of performing with Aoife O’donovan, Darol Anger, Sean Watkins, Darrell Scott, Laurie Lewis, Tim O’Brien, Mike Marshall, Kai Welch, John Reishman, and Rushad Eggleston. Their debut album is set to release this month, and we’re excited to help them spread the good news. Their music is fine and supple, rough and ready, innovative and timeless. See the Concerts page for how to make reservations.